If you were asked to name three key components of Microsoft Excel, what would they be? Most likely, spreadsheets to input data, formulas to perform calculations and charts to create graphical representations of various data types. I believe, every Excel user knows what a chart is and how to create it. 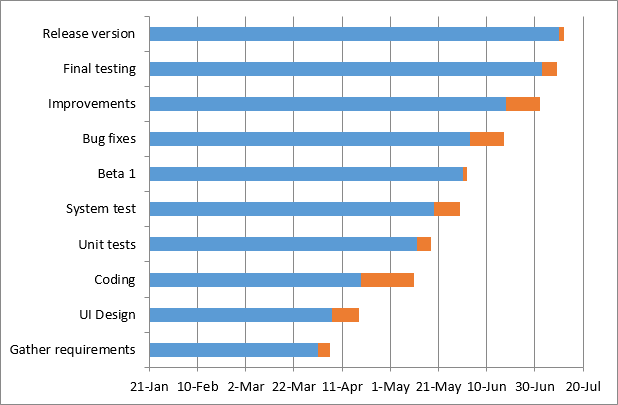 However, one graph type remains opaque to many - the Gantt chart. This short tutorial will explain the key features of the Gantt diagram, show how to make a simple Gantt chart in Excel, where to download advanced Gantt chart templates and how to use the online Project Management Gantt Chart creator. What is the Gantt diagram? The Gantt chart bears a name of Henry Gantt, American mechanical engineer and management consultant who invented this chart as early as in 1910s. A Gantt diagram in Excel represents projects or tasks in the form of cascading horizontal bar charts. A Gantt chart illustrates the breakdown structure of the project by showing the start and finish dates as well as various relationships between project activities, and in this way helps you track the tasks against their scheduled time or predefined milestones. Regrettably, Microsoft Excel does not have a built-in Gantt chart template as an option. 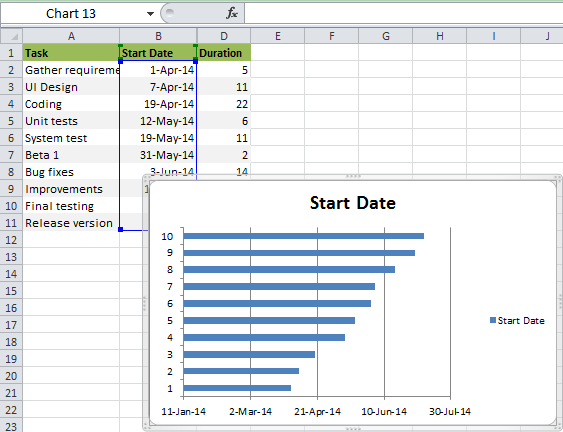 However, you can quickly create a Gantt chart in Excel by using the bar graph functionality and a bit of formatting. Please follow the below steps closely and you will make a simple Gantt chart in under 3 minutes. We will be using Excel 2010 for this Gantt chart example, but you can simulate Gantt diagrams in Excel 2019, 2016 and Excel 2013 exactly in the same way. You start by entering your project's data in an Excel spreadsheet. List each task is a separate row and structure your project plan by including the Start date, End date and Duration, i.e. the number of days required to complete the tasks. You begin making your Gantt chart in Excel by setting up a usual Stacked Bar chart. 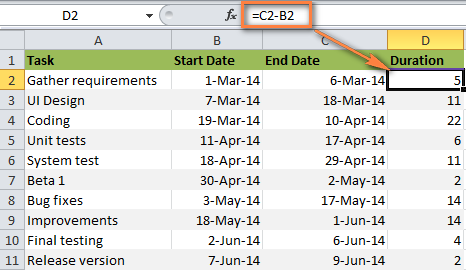 Select a range of your Start Dates with the column header, it's B1:B11 in our case. Be sure to select only the cells with data, and not the entire column. Switch to the Insert tab > Charts group and click Bar. Under the 2-D Bar section, click Stacked Bar. Note. Some other Gantt Chart tutorials you can find on the web recommend creating an empty bar chart first and then populating it with data as explained in the next step. But I think the above approach is better because Microsoft Excel will add one data series to the chart automatically, and in this way save you some time. Now you need to add one more series to your Excel Gantt chart-to-be. 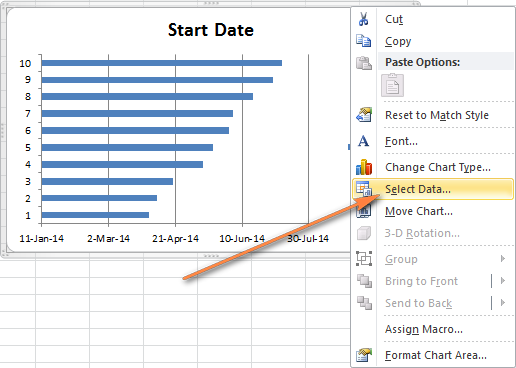 Right-click anywhere within the chart area and choose Select Data from the context menu. The Select Data Source window will open. As you can see in the screenshot below, Start Date is already added under Legend Entries (Series). And you need to add Duration there as well. 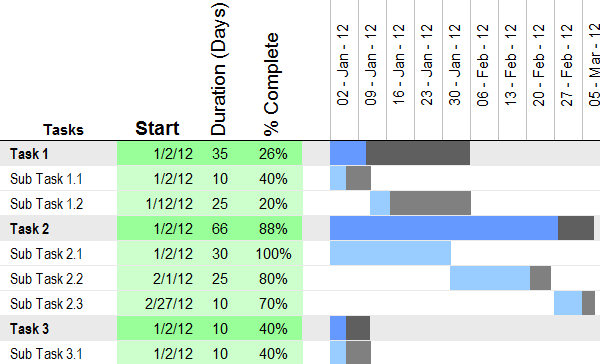 Click the Add button to select more data (Duration) you want to plot in the Gantt chart. In the Series name field, type "Duration" or any other name of your choosing. Alternatively, you can place the mouse cursor into this field and click the column header in your spreadsheet, the clicked header will be added as the Series name for the Gantt chart. 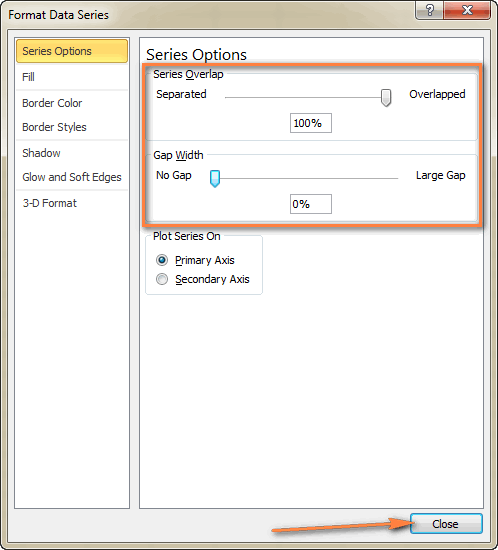 Click the range selection icon next to the Series Values field. A small Edit Series window will open. Select your project Duration data by clicking on the first Duration cell (D2 in our case) and dragging the mouse down to the last duration (D11). Make sure you have not mistakenly included the header or any empty cell. Click the Collapse Dialog icon to exit this small window. This will bring you back to the previous Edit Series window with Series name and Series values filled in, where you click OK.
Now you are back at the Select Data Source window with both Start Date and Duration added under Legend Entries (Series). 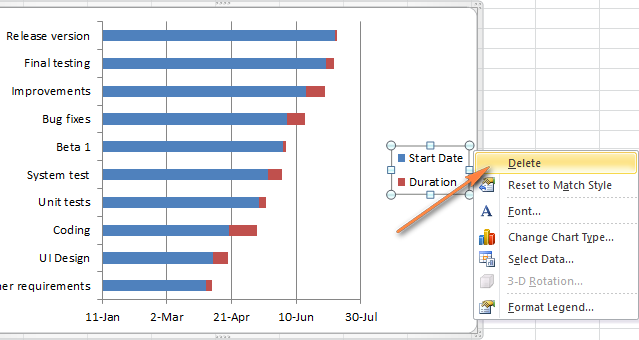 Simply click OK for the Duration data to be added to your Excel chart. Now you need to replace the days on the left side of the chart with the list of tasks. 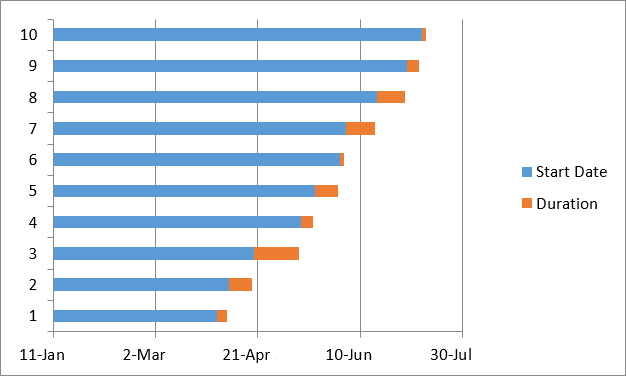 Right-click anywhere within the chart plot area (the area with blue and orange bars) and click Select Data to bring up the Select Data Source window again. Make sure the Start Date is selected on the left pane and click the Edit button on the right pane, under Horizontal (Category) Axis Labels. A small Axis Label window opens and you select your tasks in the same fashion as you selected Durations in the previous step - click the range selection icon , then click on the first task in your table and drag the mouse down to the last task. Remember, the column header should not be included. When done, exit the window by clicking on the range selection icon again. Click OK twice to close the open windows. 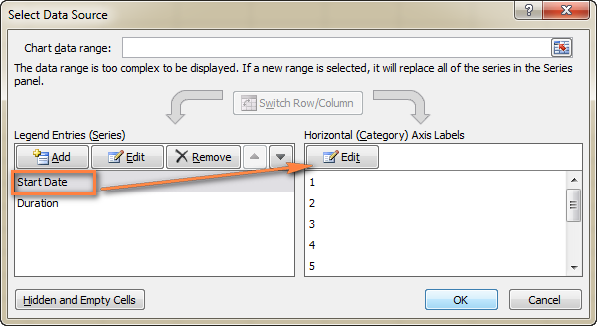 Remove the chart labels block by right-clicking it and selecting Delete from the context menu. What you have now is still a stacked bar chart. You have to add the proper formatting to make it look more like a Gantt chart. Our goal is to remove the blue bars so that only the orange parts representing the project's tasks will be visible. In technical terms, we won't really delete the blue bars, but rather make them transparent and therefore invisible. Click on any blue bar in your Gantt chart to select them all, right-click and choose Format Data Series from the context menu. Switch to the Fill tab and select No Fill. 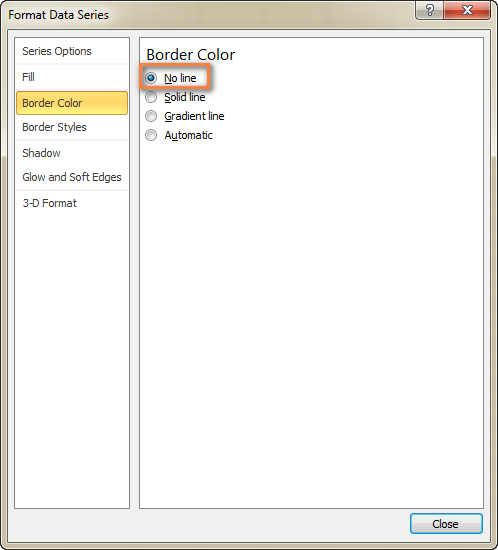 Go to the Border Color tab and select No Line. Note. You do not need to close the dialog because you will use it again in the next step. As you have probably noticed, the tasks on your Excel Gantt chart are listed in reverse order. And now we are going to fix this. Click on the list of tasks in the left-hand part of your Gantt chart to select them. This will display the Format Axis dialog for you. 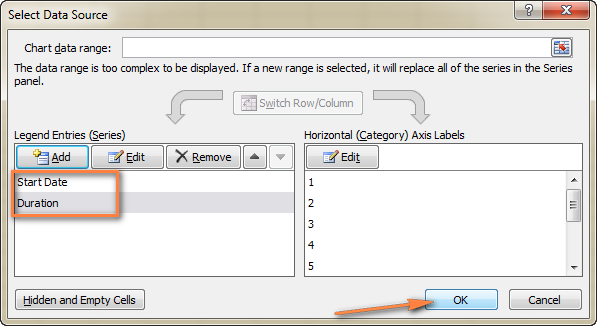 Select the Categories in reverse order option under Axis Options and then click the Close button to save all the changes. Your tasks are arranged in a proper order on a Gantt chart. Date markers are moved from the bottom to the top of the graph. Though your Excel Gantt chart is beginning to take shape, you can add a few more finishing touches to make it really stylish. Remove the empty space on the left side of the Gantt chart. As you remember, originally the starting date blue bars resided at the start of your Excel Gantt diagram. Now you can remove that blank white space to bring your tasks a little closer to the left vertical axis. 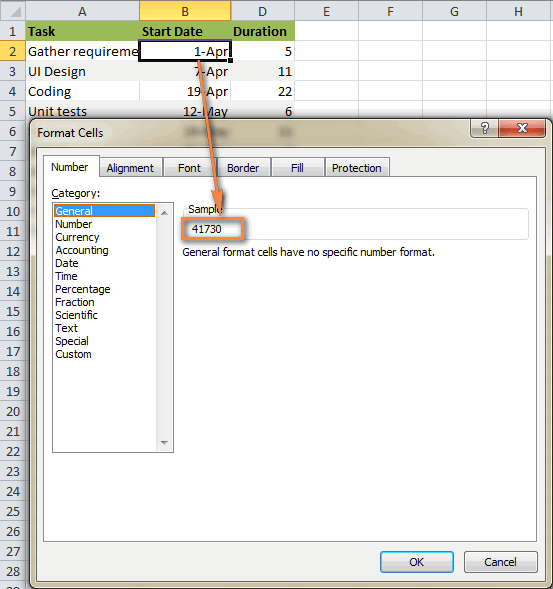 Right-click on the first Start Date in your data table, select Format Cells > General. Write down the number that you see - this is a numeric representation of the date, in my case 41730. As you probably know, Excel stores dates as numbers based on the number of days since 1-Jan-1900. Click Cancel because you don't actually want to make any changes here. Click on any date above the task bars in your Gantt chart. 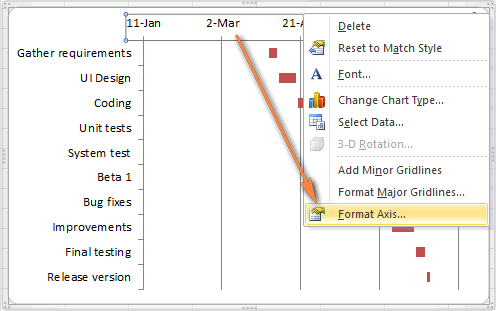 One click will select all the dates, you right click them and choose Format Axis from the context menu. 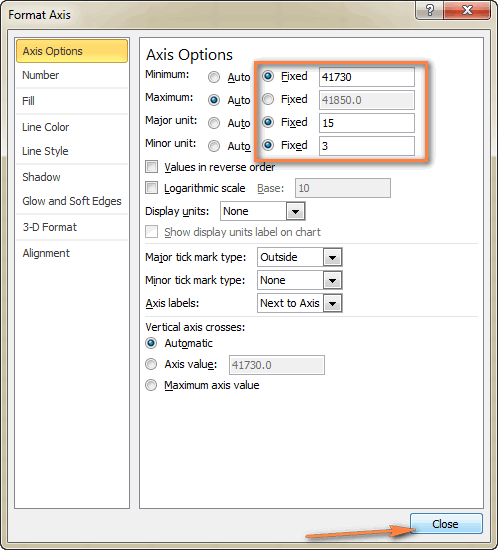 Under Axis Options, change Minimum to Fixed and type the number you recorded in the previous step. Adjust the number of dates on your Gantt chart. In the same Format Axis window that you used in the previous step, change Major unit and Minor unit to Fixed too, and then add the numbers you want for the date intervals. Typically, the shorter your project's timeframe is, the smaller numbers you use. For example, if you want to show every other date, enter 2 in the Major unit. You can see my settings in the screenshot below. Note. In Excel 2013, Excel 2016 and Excel 2019, there are no Auto and Fixed radio buttons, so you simply type the number in the box. Tip. You can play with different settings until you get the result that works best for you. Don't be afraid to do something wrong because you can always revert to the default settings by switching back to Auto in Excel 2010 and 2007, or click Reset in Excel 2013, 2016 and 2019. Remove excess white space between the bars. 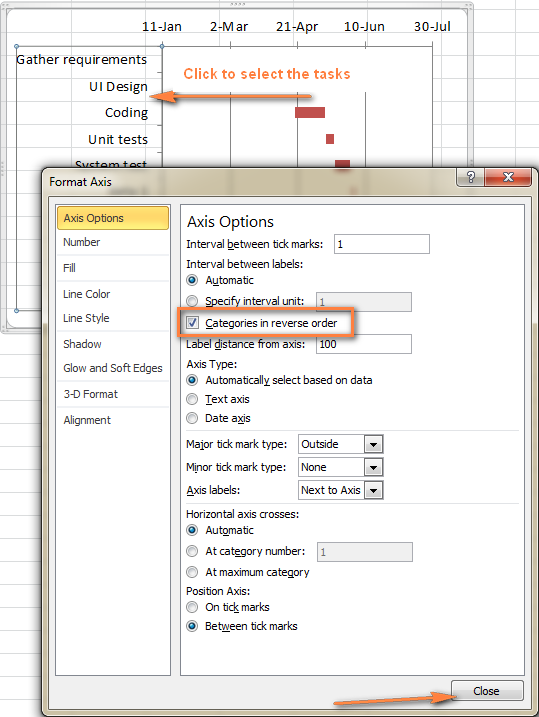 Compacting the task bars will make your Gantt graph look even better. Click any of the orange bars to get them all selected, right click and select Format Data Series. 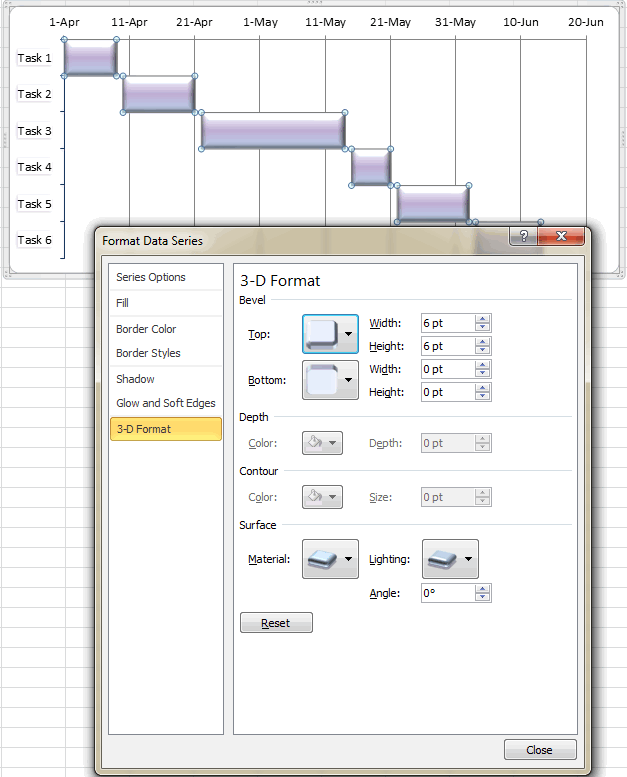 In the Format Data Series dialog, set Separated to 100% and Gap Width to 0% (or close to 0%). Your Excel Gantt chart will resize when you add or remove tasks. You can change a Start date or Duration, the chart will reflect the changes and adjust automatically. 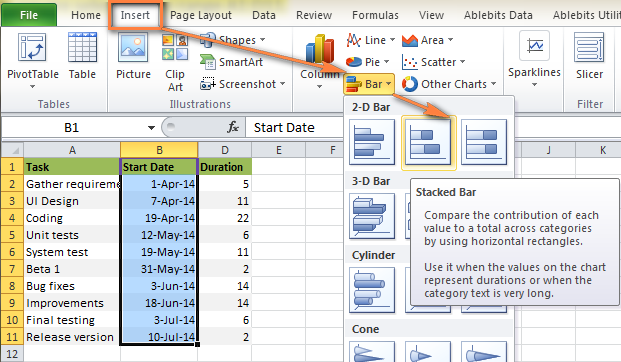 You can save your Excel Gantt chart as an image or convert to HTML and publish online. You can design your Excel Gant chart in different ways by changing the fill color, border color, shadow and even applying the 3-D format. 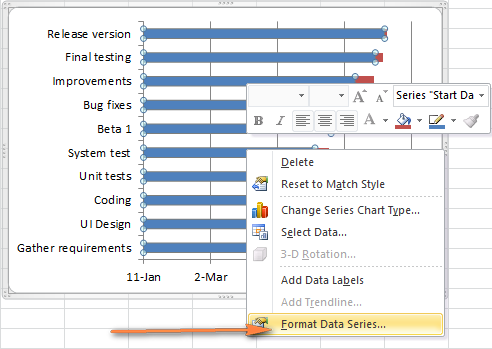 All these options are available in the Format Data Series window (right-click the bars in the chart area and select Format Data Series from the context menu). When you have created an awesome design, it might be a good idea to save your Excel Gantt chart as a template for future use. To do this, click the chart, switch to the Design tab on the ribbon and click Save as Template. 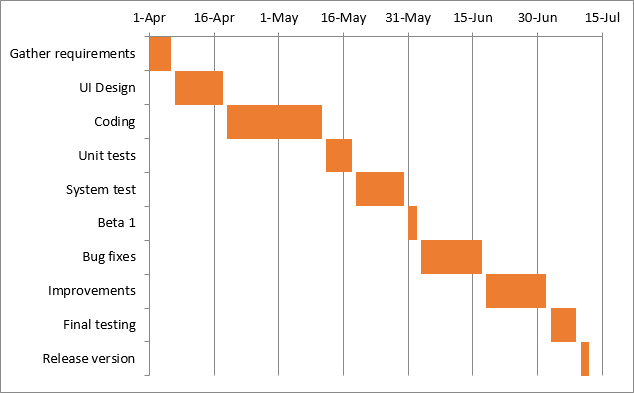 Download this Gantt chart example. As you see, it's not a big problem to build a simple Gantt chart in Excel. 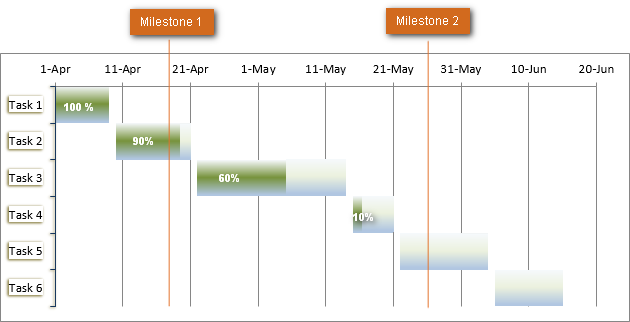 But what if you want a more sophisticated Gantt diagram with percent-complete shading for each task and a vertical Milestone or Checkpoint line? Of course, if you are one of those rare and mysterious creatures whom we respectively call "Excel gurus", you can try to make such a graph on your own, with the help of this article: Advanced Gantt Charts in Microsoft Excel. However, a faster and more stress-free way would be using an Excel Gantt chart template. Below you will find a quick overview of several project management Gantt chart templates for different versions of Microsoft Excel. This Excel Gantt chart template, called Gantt Project Planner, is purposed to track your project by different activities such as Plan Start and Actual Start, Plan Duration and Actual Duration as well as Percent Complete. 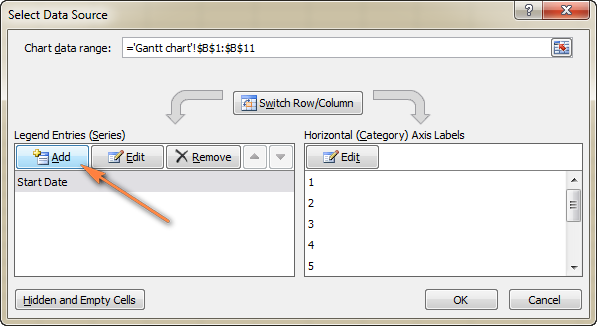 In Excel 2013, 2016 and 2019, just go to File > New and type "Gantt" in the Search box. If you cannot find it there, you can download it from Microsoft's web-site - Gantt Project Planner template. This template requires no learning curve at all, simply click on it and it's ready for use. This is an Interactive Online Gantt Chart Creator from smartsheet.com. 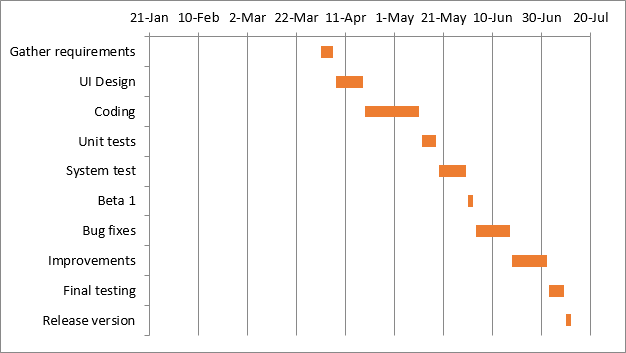 As well as the previous Gantt chart template, this one is fast and easy-to-use. They offer 30 days free trial, so you can sign with your Google account here and start making your first Excel Gantt diagram online straight away. The process is very straightforward, you enter your project details in the left-hand table, and as you type a Gantt Chart is being built in the right-hand part of the screen. Gantt chart template from vertex42.com is a free Gantt chart template that works with Excel 2003, 2007, 2010, 2013 and 2016 as well as OpenOffice Calc and Google Sheets. You work with this template in the same fashion as you do with any normal Excel spreadsheet. Simply enter the start date and duration for each task and define % in the Complete column. 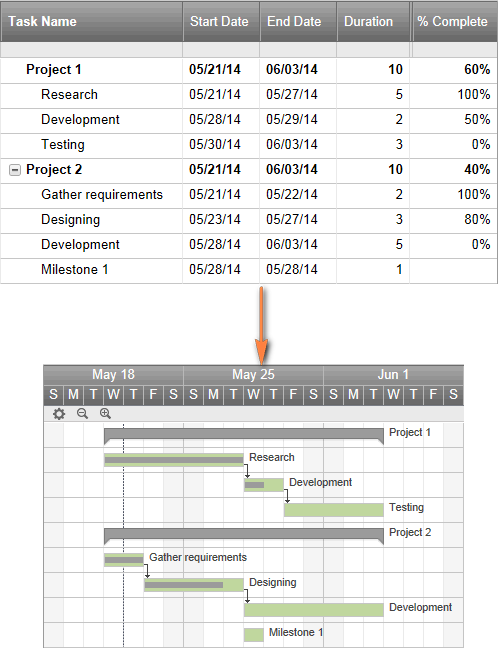 To change the range of dates displayed in the Gantt chart area, slide the scroll bar. And finally, one more Gant chart Excel template for your consideration. Project Manager Gantt Chart from professionalexcel.com is also a free project management Gantt chart template for Excel that can help track your tasks against their allocated time. You can choose either the standard weekly view or daily for short term projects. Hopefully, at least one of the above-mentioned Gantt chart Excel templates is well suited for your needs. If not, you can find plenty more Gantt chart templates on the web. 283 Responses to "How to make a Gantt chart in Excel 2010, 2013, 2016 and 2019"
Thank you for the excellent step-by-step instructions with example screen shots. With your instructions I was able to create a Gantt chart in my existing spreadsheet that provides an nice visual to target dates. Thank you so much for this Svetlana. Very easy to follow and perfect for what I need. Excellent work!! Thank you so much, you helped me out of a sticky situation. so kind of you to share your knowledge. Thank you so much! Very informative and useful. Thank you, It was explained well. Thank you for the simple, straightforward instructions. Just what I needed and I have my own template now that I can quickly fill in and put to use. One questions: how did you make the date labels show the mid of the month and then the end of the month? By setting the "major units" at 15, makes the labels to be shown every 15 days, which not necessarily falls on the mid or end month, since some months will have 31 days. How to show the labels as: Jan 1, Jan 15, Feb 1, Feb 15, Mar 1, Mar 15, etc ? very appreciated for the sharing! It's very helpful to me! Thanks Svetlana - this was very easy to follow. Clear, concise steps with suitable screen-shots. Good work but I observed that the start date on the Gantt chart doesn't tally with data. You can change the start date as explained in Step 6. Improve the design of your Excel Gantt chart. Very impressive illustruation made it easier to follow. Really helped me to finish a Gantt chart under an hour. This is a fantastic tutorial, and such a help to those without access to MS Project. Great job! Thanks for step by step instructions. Really enjoyed this. Thanks for this useful, clear and helpful tutorial! I made a gantt chart and after few days I wanted to edit it and while clicking select data saw the message . Do you know the reason and way to fix it? Thanks so much for the detailed step by step method of creating a Gantt chart. It was really helpful. This was really helping!! Although i has some trouble with Step 5, number 2 and had too play around with some of the options. I have an additional line for each Task that is for the Actual Duration and is directly under the estimated Task line. I'd like the colors on the gantt chart to be different for the Actual Duration but have no idea how to do this in excel. Please help! I think the equations would remain the same, but how do I ONLY have that formatting work for rows that are "Actual Duration"? And keep the original formatting for everything else? I have no words to thank you for the above detailed draft illustration. Really, really thank you. I did my UNI Guntt Chart following your instruction and it was all accomplished within 30 minutes. Amazingly straightforward. Really clear instructions and excellent use of visual aids/screenshots to assist the process. Awesome step by step explanation. Thanks for this post, very clear and helpful! Excellent step-by-step instructions - thank you! Am so grateful for this. A managed to make my grant chart for my reseach presentation.